I split the Hadoop downloads into a stacked histogram showing Hive, HBase and Avro separately. Over this time span, the more SQL-like Hive beat out HBase with 50% more downloads: 3,682 to 2,360. This could be a reflection of the growing popularity of Big Data applications for people new to the Hadoop ecosystem, who are looking for a familiar toolset to lower the barrier to entry. 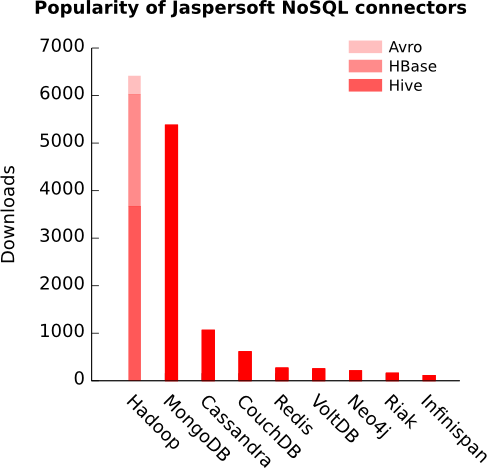 Avro, which you may not have heard of, is a serialization format for Hadoop that’s designed for data-intensive applications, so it’s no surprise that a niche use case shows less popularity than the more broadly applicable HBase and Hive methods for accessing Hadoop. The thing that’s particularly powerful about this data is that everyone has something like it. Whether it’s download statistics or web traffic, it can all provide useful insights — especially when combined with other data like we can do with RedMonk Analytics. Disclosure: Jaspersoft is not a client. Hadoop distributor Cloudera as well as MongoDB-based 10gen are both clients, but Cassandra support company DataStax is not.